It’s Monday, and it’s the first work day back in January for many people (including myself.) 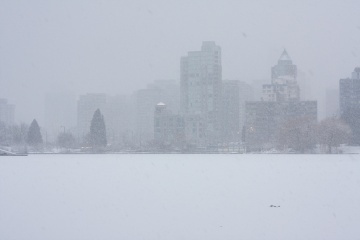 In Vancouver, it’s currently grey and slushy, with a mild case of yuck. Cars are slipping and sliding all over town, sidewalks are buried under half-a-foot of slush, and I have to wait another few days for Mats Sundin to join the Canucks. Sigh. A popular request, this one seems pretty straightforward. I’m going to see what I can do about making it happen unobtrusively. This is, again, another popular request. I think the way I’ll be implementing this to start will be the simplest possible method — allowing the original author to close off a story at any point. If it becomes a problem in collaborative stories (which was always a concern I had) and the feature is abused, I’ll have to put in a more elaborate system where all authors in a collaborative story would vote to close a specific chapter/branch. The invite-a-friend form, a feature you see on many other sites, is something I’ve been meaning to build for ages. I keep getting sidetracked by other stuff, so I’m putting it in here to make sure that I get it done. :) It’s something that’s been missing from the site since launch and I’ll be adding it in soon. I know that the “My Stories” page (which is just a search filter, currently) has been lacking for a long time, so I’m going to see what I can do to spiff it up and make it a little more useful. I’d love for it to become a centerpiece of your writing portfolio, down the line, but for now I’d settle with making it a little easier to use and friendlier to our authors. Something I’ve noticed in heavy use on the site since we gained the influx of Ficleteers is the “you’ve been tagged to follow up on this story” comments that people have been posting on each other’s profiles. I’m going to add an actual option to invite someone to follow-up on your stories. I think it’ll make everyone’s life easier and it’ll reduce a bit of the comment spam I’m seeing in the activity feeds right now. I think that’s it for the time being. If you have any suggestions for other changes I could make, or additions to what I’ve posted above, please comment here or post over on the Help Center! Cheers, and happy new year to all of our Protagonists! Photo courtesy of TylerIngram on Flickr. This entry was posted in Features, General, Site updates and tagged 2009, author tagging, dead-ends, drafts, Features, invites, january, my stories, word counts. Bookmark the permalink. I love the ideas you posted here, most especially the ability to leave stories in “Draft” form, which is something I really took advantage of in Ficlets. I think Protagonize so far is pretty darn awesome.The only thing it doesn’t have that I dearly miss from Ficlets is the inspiration feature, where you could use a picture, a quote, etc. to jump-start your creativity. Wow, so many great things on the way! This is an exciting place to be part of. I particularly like the one about tagging other authors for participation in a story. I think my biggest wish list item is just the removal of the 24-hour-or-someone-writes-a-sequel restriction on editing. I don’t much like having a story of mine Stuck Forever with a typo that I didn’t see at the time but is now glaringly obvious. And sometimes you just want to rewrite part of something old, and make it better. Back on Ficlets (which I’m sure you’re more than sick of hearing about) it was nice to go back and blatantly retcon a chapter for continuity or to add foreshadowing. Of course people may abuse it from time to time, but I think it’s still worth it! Your suggestion gave me an interesting idea. To be honest, the time limit on edits is pretty arbitrary – it used to be an hour, now it’s 24 hours. It could be infinite as far as that goes. As for not allowing edits when someone’s posted a follow-up, that’s to avoid continuity issues. Now, if I were to add a switch to stories where the author could decide whether to allow edits after-the-fact or not, would that be a suitable solution? It could be a toggle in story settings, much like the mature flag and solo/collaborative flags. That way, authors worried about continuity issues could disable edits, but you could also leave them on and edit at any time… thoughts? Another idea would be to take a similar approach to dead-end stories, etc and allow edits, but on collaborative stories edits to things that have posts that continue on from it need to be approved by a majority of people further down the chain. I think that sounds like a fair compromise. Editing earlier chapters can be used to fix continuity errors (via retcon) just as easily as it can be used to make them. I think generally it’s a good idea just to give authors the benefit of the doubt when it comes to their work. @DarkLiquid Yeah, sounds kinda Wikipedia-style. That’d be a bit more challenging to implement, so I’ll probably leave the option open for adding it down the road. I’ll see what I can do about adding this in my next batch of changes… hopefully in the coming couple of weeks. Hey guys, just a quick note to let you know that the editing feature is now live on the site. You can make a story editable at any time via story settings (if you’re the original author) or when you publish it. Let me know how you like it!